RUSSIAN GRAND DUKE SVYATOSLAV MEDAL. The table medal you are looking at, came from a Russian ruler series which covers the rulers of Russia from Rurik to Emperor Paul I, and are consecutively numbered. 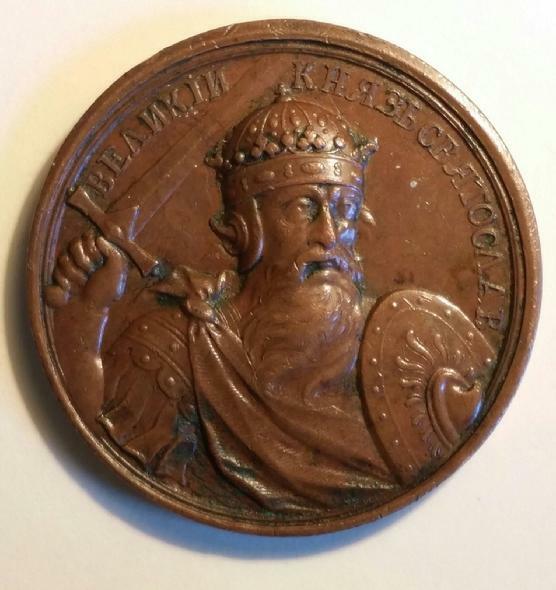 Made in the 19th century in bronze, size 38 mm. This is #5 medal of the Russian Ruler Series. 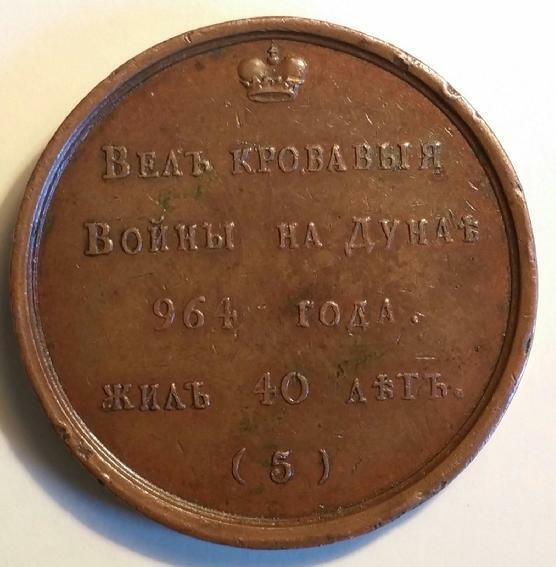 Obverse: In Russian: GREAT DUKE SVIATOSLAV. - Cuir. bust of Sviatoslav with sword in l. hand and shield in r., facing r. Reverse: In Russian: LEAD BLOODY/WARS ON DONAU/YEAR/964/LIVED 40 YEARS./(5) Medalist: Robert Hanneman. Russian in full Svyatoslav Igorevich (died 972), grand prince of Kiev from 945 and the greatest of the Varangian princes of early Russo-Ukrainian history. He was the son of Grand Prince Igor, who was himself probably the grandson of Rurik, prince of Novgorod. Svyatoslav was the last non-Christian ruler of the Kievan state. After coming of age he began a series of bold military expeditions, leaving his mother, Olga, to manage the internal affairs of the Kievan state until her death 969.